This is a Fashionista Event and a promotional item was provided to me by Sweetworks. Hosts for this event are Still Blonde after all these Years and ModlyChic. Halloween is the favorite Holiday of this house. 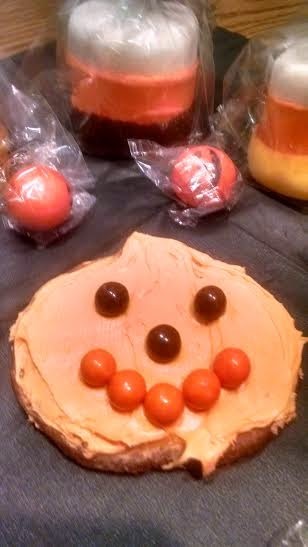 We are planning a big Halloween party with over forty friends, relatives and neighbors. We can’t wait to rent out an old meeting house down the road and turn it into a haunted house. Over the years we have gathered fun items to make it just perfect. When a huge box of Sweetworks Candy arrived at the door we couldn’t wait to “practice” making some of our treats. The Pumpkin Sugar Cookies with Cream Cheese frosting looked perfect after the little guys added some Sixlet faces to them, as you can see above. 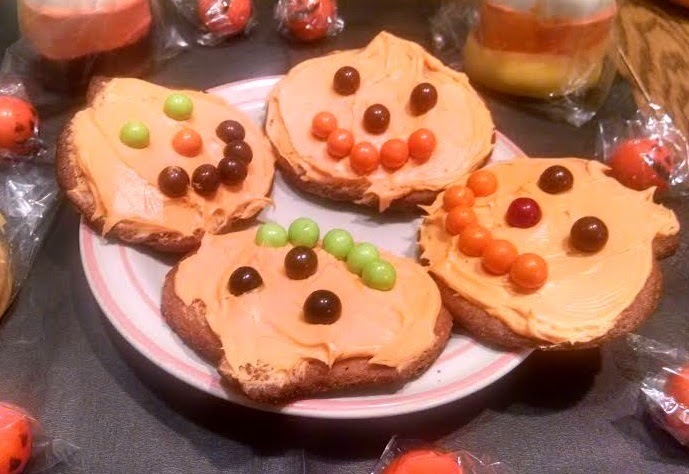 These cookies are the perfect fall treat. Below is the recipe so you can try your own. Wisk flour, baking powder, and salt in a medium bowl and set aside. In large bowl cream butter and both sugars until light and fluffy with mixer. Add egg and vanilla beat Just until combined. Add dry ingredients and beat on low about 30 seconds. Make a ball and refrigerate at least 1 hour. Place refrigeratored dough on a lightly floured surface, let sit for 10 minutes. Using a rolling pin spread dough to about 1/4-inch thickness. Use your favorite cookie cutters and cut the dough. Place on baking sheet and return to refrigerator for at least 15 minutes. Heat oven to 375 Degrees. Bake cookies for 8-9 minutes until edges turn the slightly light brown. Cool on a wire rack. We love this Cream Cheese frosting recipe that we found on All Recipes .Com. Now to hide the rest of the candy from the family, and myself until Halloween. SweetWorks has a huge variety of high quality treats so it may not be easy. They have been in business for 5 decades, and carry 44 Halloween candies are perfect for your festivities. If you are looking for the perfect candies for your gathering look no further. Sweetworks has everything set up so you can even shop by color. This is an easy way to find the perfect candies to match your themed parties and color scheme. 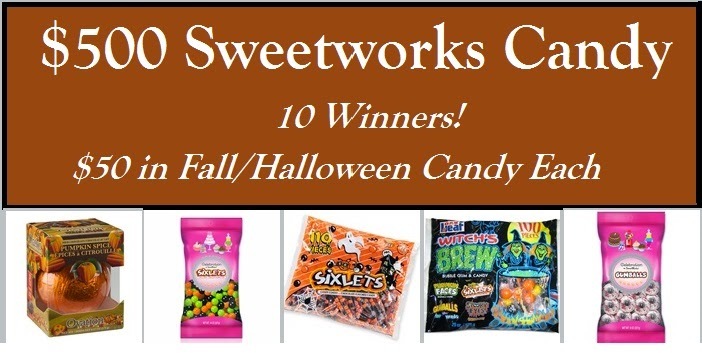 Myself and some fellow bloggers are excited to be a part of a giveaway for over $500 Sweetworks Candy. This giveaway will run on all of our blogs and will have a total of 10 winners. Each winner will receive $50 worth of Fall/Halloween Candy. You can enter through the rafflecopter below.